Is Cal&igrave; turning in his grave? Is Calì turning in his grave? We need to take fast action to preserve our Maltese heritage from being lost for good. Mary Attard shares some insights. One of Malta's best painters of the 19th century was certainly Giuseppe Calì (1846-1930). He was a prolific artist and founder of the modern school of Maltese painting, a genius with an output amounting to some 620 works. Two of his major works were The Death of Dragut (1867) at the Museum of Fine Arts and St Jerome (1881) at the Sacro Cuor Church in Sliema. Some of his paintings are now being threatened and need urgent care. 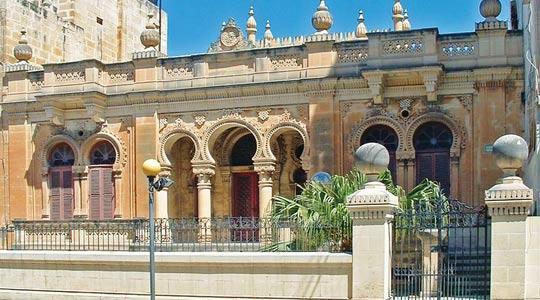 Valletta's St Dominic Church is one example where priceless Calì paintings need immediate attention due to cracks and water leakages which are causing the works of art to flake, stain and lose paint. Thankfully, a plea for help in dealing with the restoration is being made to stop any further damage. But there are other Calì works of art that few know about and which are in very good condition - up to now. These are at the Alhambra, a property which was used as a summer residence of leading Maltese architect Emanuele Luigi Galizia (1830-1906). The Addolorata Cemetery (1860), Ta' Braxia Cemetery (1855) and the Turkish Cemetery (1874) were only a few of Galizia's other vast diverse projects. The Alhambra is one of a complex of three Moorish houses which Galizia had undertaken in Rudolphe Street, Sliema. They had started off shaping this street back in the 1880s while the area was still a pastoral landscape with views overlooking Marsamxett Harbour. The Alhambra was kept by the architect for himself as his summer residence and some five generations inhabited the villa since then until some six years ago, when the owners felt that keeping its maintenance was becoming a challenge to them. This was sold to other owners on condition that the place would be preserved and not demolished to be replaced by some block of flats. A contractor was engaged to faithfully restore any damaged architectural features or sculpture at the Alhambra and work in tandem with Mepa to adhere to this condition. As if Galizia, the prestigious architect, were not enough to give the place its priceless merit, there is another factor that matters in the value of the place. Galizia had designed the Alhambra on a Hispanic-Moorish style which was the influence he got from his studies and travels of the time. He gave the entrance hall a baroque flavour to the door frameworks, giving a visual transition to the place from the aristocratic Moghul-Moorish character of the façade to the Victorian functionalism of the interior. Calì found this transition inspiring and to enhance the effect he painted four charming murals which fitted beautifully with the cosmopolitan, refined yet homely spirit suitable for a summer residence of a man of the world that Galizia was. These four putti, known as The Four Seasons, were intended as a tribute to Vivaldi and were painted directly on the walls on top of each of the four entrance doorways. These paintings by Calì bring in an additional touch of colour, freshness and vivaciousness to the place, besides being an added treasure to the Alhambra. For these four paintings only it would have been a good enough reason for the Alhambra to be treated with the deserved respect and preservation. The Alhambra is also a unique example of collaboration of the best Maltese painter and a leading architect of the time in one project. In fact the villa is a Grade 1 listed property. Together with its garden and interior it must be saved for future generations. The Alhambra consists of large rooms with fireplaces and at the back a wooden deck used to lead one down to the garden by means of wooden steps. This deck has deteriorated but pictures exist for it to be similarly replaced. An interesting central stairway in the middle of the building, just beyond the entrance hall, leads to a basement with further rooms. There are some 12 rooms in all. Distinctive stained glass is still authentically preserved. A spiral staircase leads to the roof which is also uniquely decorated. From the two similar buildings in Rudolphe Street, only the Alhambra has retained its original garden - the garden of the other building (which was for some time used as a school of hairdressing) had to make way for a garage. The Alhambra garden can also be reached through an ornate gateway from the back side of the block in Tonna Street. Much has been done recently in the way of maintenance, but the place is still in need of some further care by someone who can appreciate its intrinsic and distinctive qualities and who would lovingly take it over with pride knowing that an important and irreplaceable piece of Maltese history is being preserved for future generations.